What brought this all to mind was my visit the other night to a new,elegant restaurant down the street from my dad’s old digs, between his place and The Hut. From there with their fancy cocktails and their lime and coconut hot popcorn bar snacks, I looked at the view that I had shared with Daddy on hot summer nights. 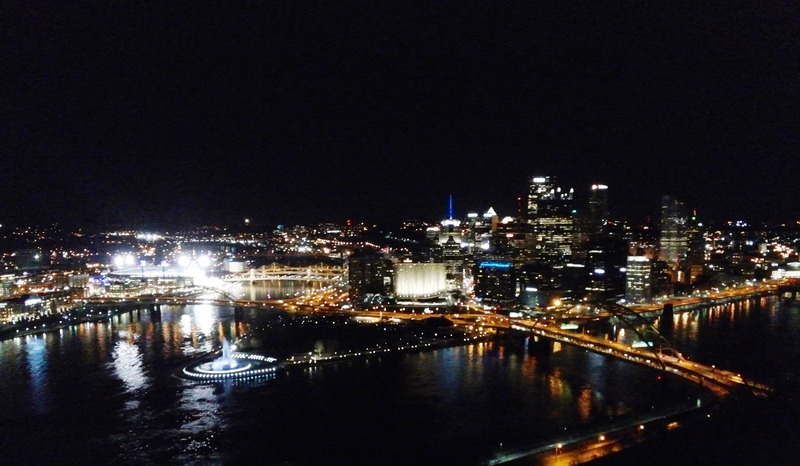 Certainly not the same view, but a nearly identical perspective on downtown Pittsburgh. It’s not exactly the same because the narrow place that housed my father for nearly a decade has been removed along with a half dozen others, saved from tumbling over the cliff by demolition. They were built atop defunct coal caves older than the former business district and nearly anything else in the history of this neighborhood. I looked out and was awash in satisfaction at how beautiful my city looked on a glorious, long-awaited early spring night. As I walked out I noticed that the neon bar signs for Iron City were lit at The Hut, which had been shuttered for a few months. I am surely not without misplaced nostalgia; but I walked past, refusing to enter, as I continued to bask in Pittsburgh’s 21st century beauty. I am really missing the burgh now. S’liberty had similar places as the Hut but without the view of course. I stopped in a coffee shop that replaced the pharmacy that I worked at during high school during my last visit. It was weird knowing that I was sitting at a spot of the earth sipping coffee where I had spent so many hours on my feet 4 decades ago. I looked at everyone that came in trying to see if I knew them or could see a family resemblance. Nostalgia is a very strong emotion. Nice post Erin. Being I grew up around the corner on Oneida St I can appreciate it even more. From how you describe things I remember this as if it were yesterday. My favorite story of The Hut is when my dad got,into a fight up,there with the Doyle brothers. After breaking an arm of one and busting the head of another with a pool cue the police came banging on the door where we lived at my grandparents house. He got off as it was determined, even as drunk as he was, that he was defending himself against a couple bullies that on that particular day met their match. wonderful, as always, makes me feel like I’m there with you.